“We’re big fans of French synthpop like Jacno, Deux, Ruth and Serge Blenner. This kind of playful synthetic sound mixed with weird and sometimes depressing poetry had a big influence on us as kids and as musicians,” reveal the French duo DAT POLITICS. Since 1999, Claude Pailliot and Gaetan Collet have been working on music shaped by those influences, without referring to them directly. The initial spark that led to the founding of DAT POLITICS happened during the mid 1990s. The two met for the first time at a party somewhere in the Champagne-Ardenne region of France and then started DAT POLITICS in the garage of Gaetan’s parents. This time around, their songs took shape once again under influences outside of music such as astronomy, philosophy and programming language as well as surrealism, fantasy films and their own dreams. The nine tracks, all of them created last winter in a small cabin in northern France, occupy an eclectic territory that includes catchy melodies, versatile singing with pop appeal, and playfully rocking chiptune, synthwave and electro. The whimsical tour de force was recorded using computers, old beat-up synthesizers, worn out keyboards, samplers, voice boxes and kids’ play instruments. Claude and Gaetan whisper into the microphone in French and English, their voices naked or distorted by a vocoder, at times using both languages in the same song, as the track ‘Reptiloid’ demonstrates with poignant levity. Both of them grew up in the 1980s to the music of Depeche Mode, Yazoo, OMD, Jean-Michel Jarre, Jacno and Kraftwerk, and this can be perceived just as much as their love for the music of Tangerine Dream, Klaus Schulze and the soundtrack worlds of Ennio Morricone, Giorgio Moroder and John Carpenter. Yet DAT POLITICS is not a band that repackages its personal preferences. The duo acts rather as a human filter for all forms of art, which is later transformed into something totally autonomous using a creative ‘cut-up’ method as practiced by Williams S. Burroughs and Brion Gysin. Although you don’t notice it at first, the laid-back, undulating song ‘Black Hole’ is influenced by the comics of American artist Charles Burns. But if you are familiar with the work of the cartoonist, the lyrics will give you a sense of the existential weight that make his comics so special. In any case, the lyrics of DAT POLITICS never refer directly to anything tangible. They are instead a combination of surreal stories, hidden meanings and a search for clues within one’s own subconscious. They are always written after the music has been composed. And since DAT POLITICS seeks mainly to electrify in a live setting, every new track begins with bass and rhythms. 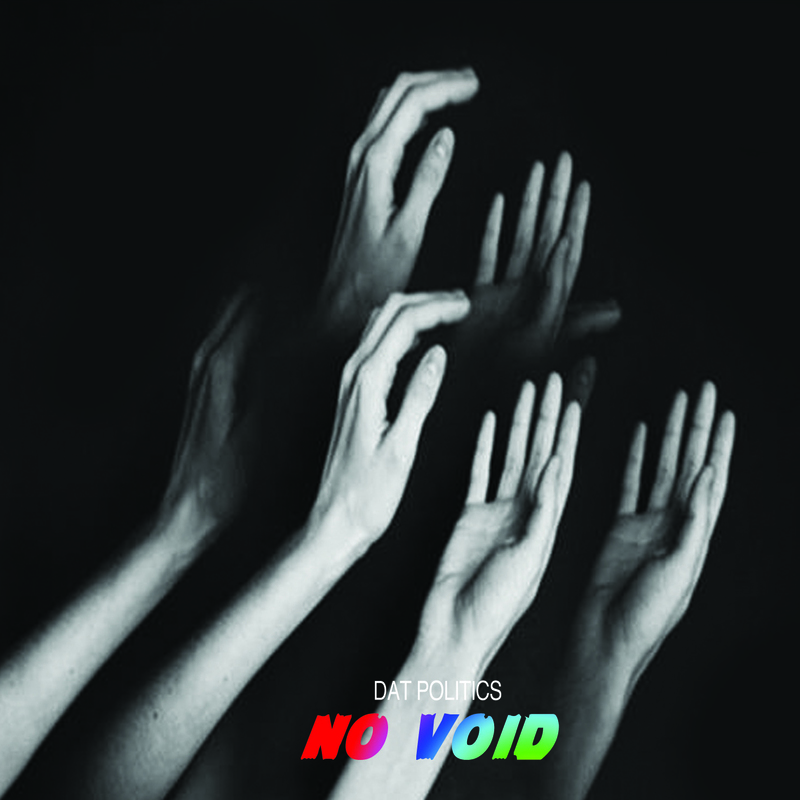 Despite the atmospherically dense interplay between melancholy and joy, this approach is what makes ‘NO VOID’ above all an album intent on rocking it in high style.